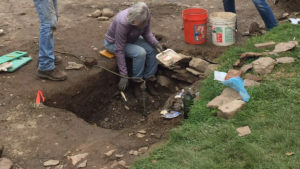 The work was required by the Connecticut State Historic Preservation Office to ensure that significant archaeological resources would not be impacted by the construction of a new Education and Visitor Center for the museum, which is scheduled to begin late-2018-19. 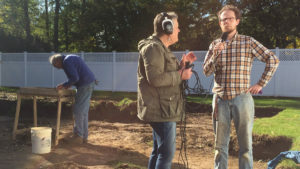 The most significant archeological find so far is an intact palisaded or fortified wall associated with a large number of artifacts dating to the 1630s, the time of Wethersfield’s initial settlement. 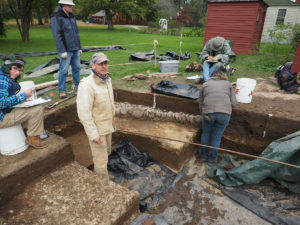 According to State Historian Walter Woodward, the discoveries at WDS will provide invaluable information that helps historians and archaeologists to understand this early period in Connecticut history, about which very little is known. 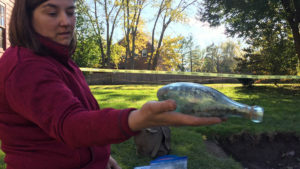 Also recovered are thousands of 17th- to 19th-century artifacts from across the rear yards of the Webb and Deane houses at WDS. 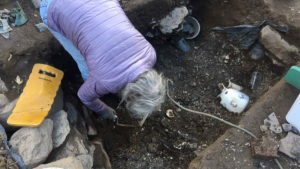 In addition to the recovered artifacts, which were found remarkably intact, a ground-penetrating radar survey identified possible buried cellar holes, midden (garbage) deposits, or privy remnants. The collected materials included creamware, pearlware, whiteware, redware, stoneware, kaolin, porcelain, window and bottle glass, nails, bone, shell, brick fragments, mortar, and coal. Despite the region’s long and important history, few details about the lower Connecticut River Valley’s colonial residents are known. Sportman says, “The Webb-Deane-Stevens complex represents an extraordinary opportunity to learn more about the occupants of the standing structures through time.” She explains that archaeological research can fill in gaps in the historical record and provide an invaluable contribution to understanding the lives and day-to-day activities of the house occupants. It can also shed light on the ways the occupants of the property altered the landscape as the economic and social milieu changed through time. 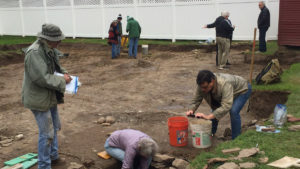 All recovered artifacts will be cleaned and catalogued at PAST’s laboratory in Storrs, Connecticut. Any significant organic artifacts, such as bone combs, metal buttons or buckles, will be bagged in the field with soil matrix, and treated separately in our artifact conservation laboratory, the only such laboratory in Connecticut. All artifacts will be boxed for permanent curation in plastic bags with acid-free labels, in polypropylene boxes. PAST estimates that 22,000 artifacts will be recovered. The recovered artifacts will be analyzed relative to the occupational history of the complex.